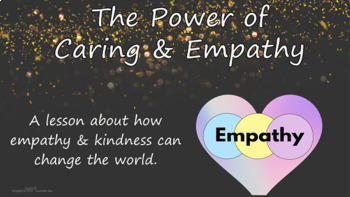 This is a 25-slide READY-TO-USE FIELD-TESTED LESSON (no prep) PowerPoint lesson that covers the topic of EMPATHY, KINDNESS, EMOTIONAL REGULATION, & CARING FOR OTHERS. 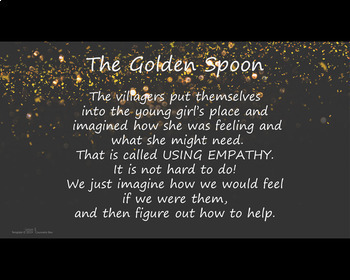 The lesson is based on a story about a young girl who helps her village to become empathetic, caring, and generous and changes everyone’s outlook. Included are links to 4 videos to support the information you are presenting. All resources and videos are included to support the concepts that are being taught. I have included notes with the slides that help you guide your lesson and give suggestions on teaching important points. I have also included a link that has many additional resources that can be utilized to develop this into a unit, if you desire. 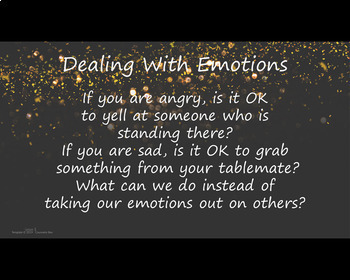 This lesson can be edited to make it fit your exact needs. The beauty of being able to personalize this lesson for yourself is that it is easily adapted to teach different levels ranging from kindergarten to fifth grade. All of my lessons and forms are field-tested. I have used them myself and have been successful with them. The videos support the concepts and help students to generalize them into their own lives and experiences. These videos are thought-provoking and entertaining ways to think about this very important concept and how it relates to being successful both now and in the future. I have found that videos are very effective in helping students to create an emotional link to the abstract concepts that character education involves. Coupled with discussions in which you can assist students to make the connection, it is an easy and effective way to teach these difficult concepts and assist students to internalize them into their own personalities. As a bonus, you also will be getting a free unique PowerPoint template that you can utilize over and over! What a bargain! A pre-made lesson ready to teach with no prep AND a unique PPT template! And all for the cost of a couple of cups of coffee!! This presentation includes slides which have transitions and animations to help to hold your students' interest. It is easily personalized and customized and includes a master slide that you can copy and paste into the location where additional information or personalization is desired. Character education is vital to the success of our students. Employers report that the qualities for which they are looking when hiring include the “soft skills” that are character education. As educators, we are called to support learning in the character education and social skills areas in order to educate the whole child. Websites and videos are NOT embedded but are links. I do not own them or control them, so if there is a problem with a broken link or something else, please let me know so that I can repair, replace, or fix the presentation for you. Anytime you have technology incorporated, you risk having related issues. I appreciate communication so that I can provide the best possible service for you. In the event that a link does not work, please contact me via the “QUESTIONS” page or can email me directly at CounselorBevsStore@gmail.com , and I will do my best to remedy the situation for you!! I want to provide the best possible product for your use. **NOTE*** links do not work in editing mode in PowerPoint. They are only active in presentation mode. Please be aware of this. Please play fair. This is intended for single classroom use only and should not be distributed or published without written permission from Counselor Bev. 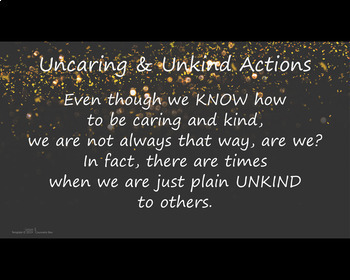 Lesson and PowerPoint template are both Copyright 2019 Counselor Bev.